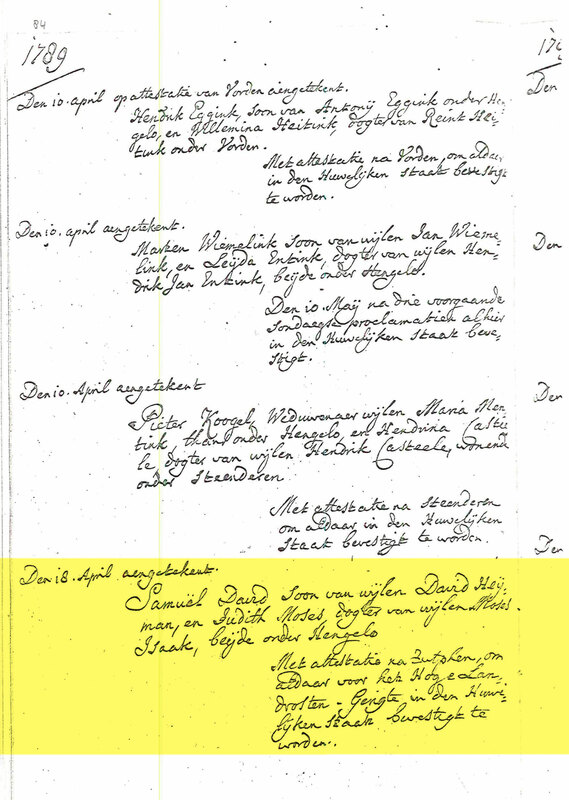 Based on discovered records, Samuel David Sterneveld (as he would later be known) was born in Buttenheim, Bamberg, Bavaria, Germany in the year 1748 (1751 per marriage).1 His father was David Heijman,2 yet his mother was not documented in record. Samuel and his family were Jewish and based on tradition Samuel's actual birth name was Samuel David, or Samuel, son of David. This is the only information we know about Samuel's childhood and early life. Neither he nor his father make appearances in existing records for the next 41 years. At this point, it isn't even in Germany. Some time over the course of these missing 41 years, Samuel relocates north into the Netherlands. The couple would settle down in Hengelo and start a family there. First was born a son, Hertz Samuels in 1790. A daughter, Judith Jacob, followed Hertz two years later in 1792. Everything seemed well as there is no mention of the family of four over the next 15 years. That would change however on 9 April 1808 when daughter Judith passed away at 16 year old. From there, things spiraled downward quickly. The couple started fresh and relocated about 15 km northwest to the growing Jewish community of Zutphen, which at this time had risen to about 100 members. 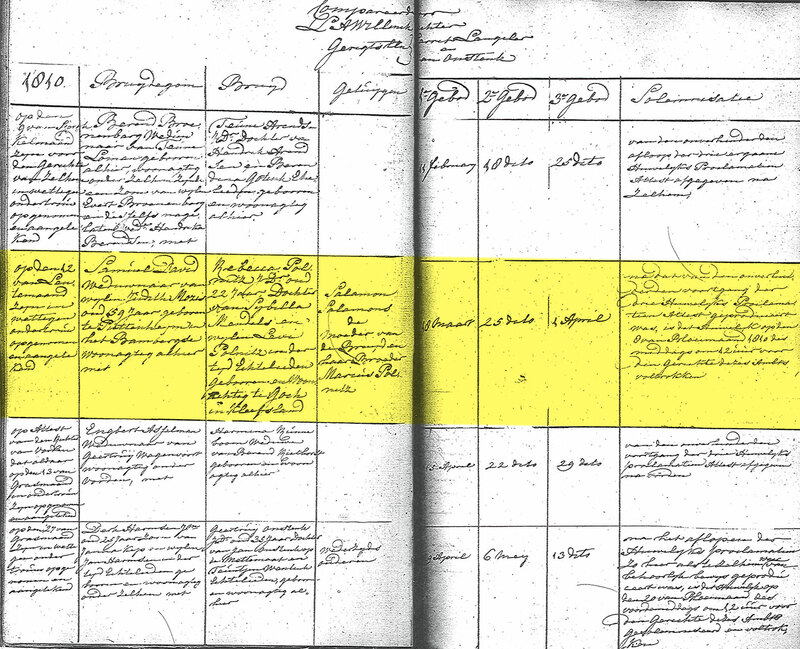 The following year, Samuel and Rebecca welcomed their first son, Philip, in Zutphen on 4 July 1812. This would be followed two years later by daughter Judith (also written as Jetjen) on 14 Feb 1814. 1816 was a rough year for the Sterneveld family. The couple not only had a baby that didn't survive childbirth on 28 Jan 1816, but then they lost their daughter Judith on 25 Jun 1816 who was only 2 years old. On 27 May 1817, twin daughters daughter, Betje and Saartje (also written as Bettjen & Saartjen) were born to Samuel and Rebecca. They were followed by a son Jacob Samuel on 14 Oct 1820, however, Jacob only survived for 3 days and died on 17 Oct 1820. Daughter Rachel Sterneveld was born 25 Dec 1821 in Zutphen. At the time of Samuel David's passing his wife Rebecca was three months pregnant. She would later give birth to a son, Samuel, on 04 Aug 1823. David Heijman, ? - ? Philip Sterneveld, 4 Jul 1812 – ? Betje/Bettjen Sterneveld, 27 May 1817 - ? Saartje/Saartjen Sterneveld, 27 May 1817 - ? Samuel Sterneveld, 04 Aug 1823 – ? A While it's just an assumption, but based on historical records of many Jewish communities, they usually existed on the outskirts of towns. The communities were poor ghettos closed off from much of the greater community and unsupported by local or national governments in any way. This forced seclusion leading to conditions would regularly cause the spread of disease. This was so common, that during the plague, Jewish communities were severely discriminated upon and even chased out of town as some people fearfully believed they were the cause of the plague. If Samuel's community was in such a shape to be considered a ghetto, then it's not a stretch to believe the death of his family would have been related to some contagious disease moving through the community. B From what I've been able to tell, the Sterneveld name with the silent extra "E" was used exclusively by Samuel David. Anyone else that registered under the name spelled it "Sternveld". This distinction continued in the decades following. 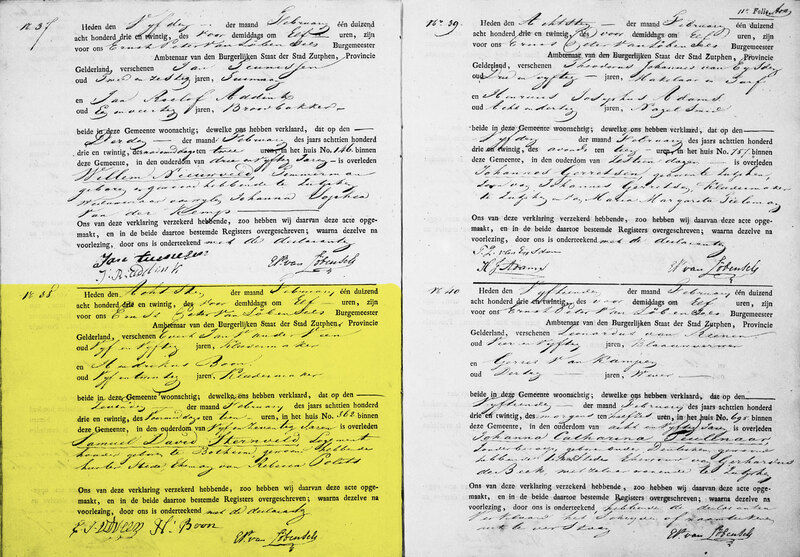 Any census or birth records using the name Sternefeld with the silent "E" can be connected to Samuel David. As far as I'm aware, two centuries later, the same holds true for the Sternefeld name. Around 1810 the number of Jews had risen to about 100, so the building [synagogue] had become too small. The kehilla [congregation], therefore, asked for help from the Government, which put neither any money nor a location at their disposal and so they decided to build a bigger synagogue by themselves. D During WWII, actions were taken by local Nazi sympathizers in the Zutphen community to desecrate the Jewish Cemetery in Zutphen displacing, removing and destroying many of the headstones of the departed Jewish residence of the town. All in an effort to wipe away their neighbors existence from history (these actions were not exclusive to Zutphen as this was happening all across Europe). 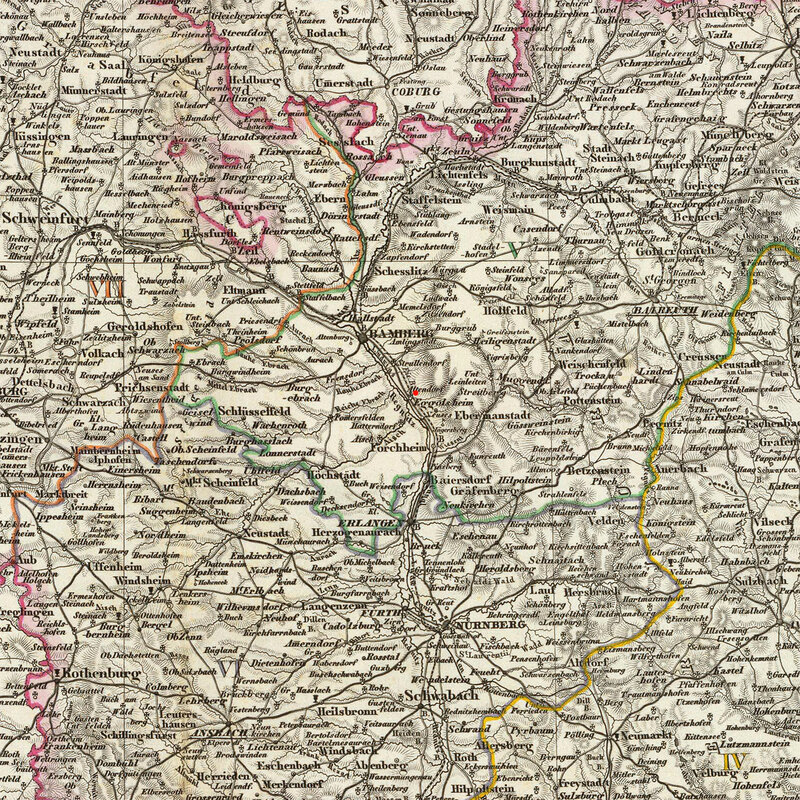 1 Death of Samuel David Sterneveld, "Netherlands, Gelderland Province Civil Registration, 1800-1952" database with images, FamilySearch (https://familysearch.org/pal:/MM9.3.1/TH-1-159365-360497-19?cc=1949343&wc=9LG2-BZ7:300763601,300544201 : accessed 30 June 2014), Zutphen > Overlijden 1823 > image 12 of 39; Rijksarchief de Gelderland, Arnhem (Gelders Archive, Arnhem). 2 Marriage [Huwelijk] Judith Moses en Samuel David, 18-04-1789, "Rijksarchief in Gelderland; Nederduits-Gereformeerde Gemeente; Hengelo; Contra-Trouwboek, 1772-1811" (http://www.geldersarchief.nl/zoeken/?mivast=37&miadt=37&mizig=128&miview=tbl&milang=nl&micols=1&mires=0&mizk_alle=samuel%20david%20judith%20moses : accessed 30 June 2014); D.T.B. 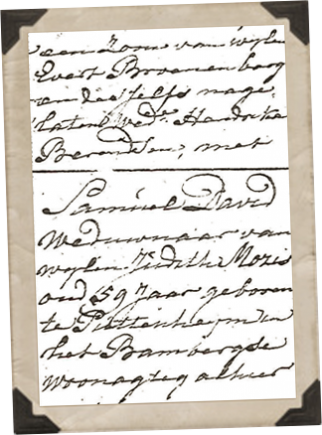 912.2; Origineel berust in archief van N.H. gemeente Hengelo; Marriage register of Hengelo, Gelderland, Netherlands, 1772-1811; Toegangsnummer: 0176; Inventarisnummer: 912.2; Pagina: 84; Scanned page: 83; Volgnummer op pagina: 4. 3 Marriage [Huwelijk] Rebecca Polnitz en Samuel David, 12-03-1810, "Rijksarchief in Gelderland; Nederduits-Gereformeerde Gemeente; Hengelo; Contra-Trouwboek, 1772-1811" (http://www.geldersarchief.nl/zoeken/?mivast=37&miadt=37&mizig=128&miview=tbl&milang=nl&micols=1&mires=0&mizk_alle=samuel%20david%20polnitz : accessed 30 June 2014); D.T.B. 912.2; Origineel berust in archief van N.H. gemeente Hengelo; Marriage register of Hengelo, Gelderland, Netherlands, 1772-1811; Toegangsnummer: 0176; Inventarisnummer: 917; Pagina: 198; Scanned page: 199; Volgnummer op pagina: 2.